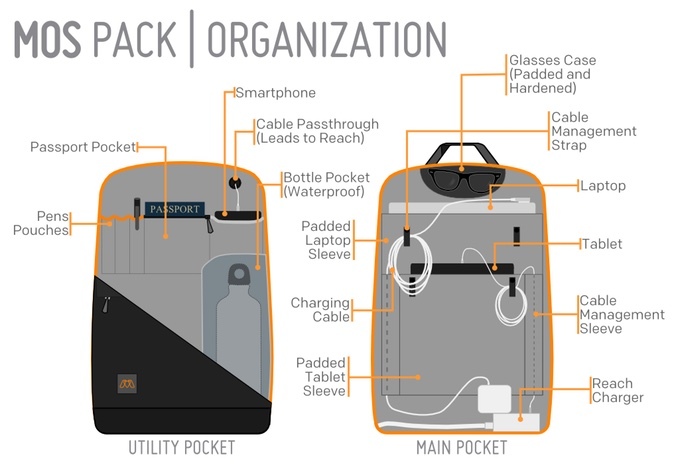 The MOS Pack, available now on Kickstarter, is a backpack that includes a built-in power strip and cable management system that allows all of the devices inside to be charged by a single power cord without taking anything out of the backpack. 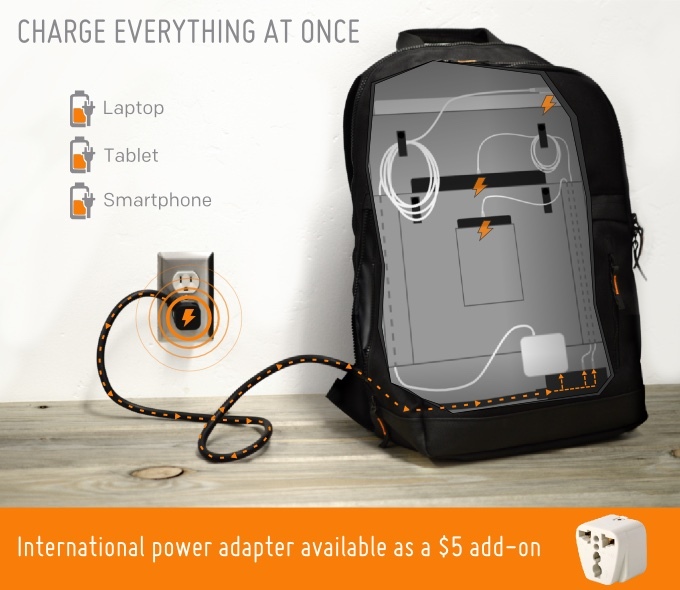 Ideal for travel, the MOS Pack can hold charging cables for a MacBook, an iPad, and an iPhone all at once, with each one plugging into an included MOS Reach power strip. The MOS Reach includes two USB charging ports for iOS devices (or other USB-powered electronics) and a standard port that can accommodate a MacBook's Power Adapter. 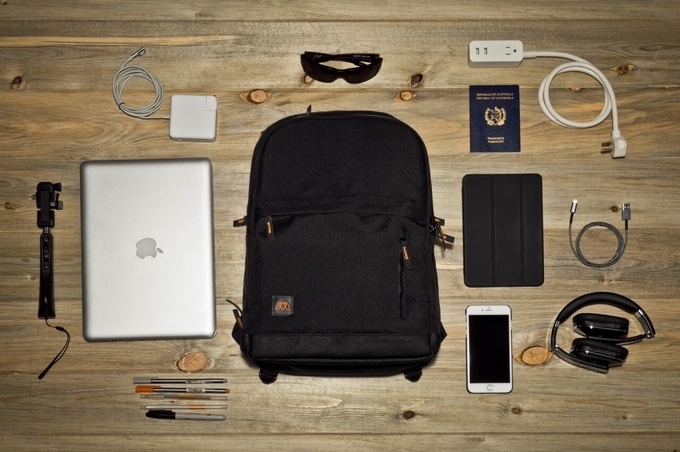 Cords are cleverly routed through cable management sleeves to keep them organized and out of sight, and the small power strip is concealed at the bottom of the backpack and kept in place with magnets. The MOS Pack includes a padded laptop sleeve, a tablet sleeve, an iPhone pocket, a waterproof water bottle pocket, a passport pocket, a hard glasses case, and slots for pens and pencils. The MOS team has produced and shipped several other products via Kickstarter, including the original MOS Magnetic Organization System, the MOS Spring, and the MOS Reach, establishing itself as a reliable manufacturer. The MOS Pack can be pre-ordered via Kickstarter for an early bird pledge of $120. When the early bird units have sold out, the price will be $140. MOS plans to begin shipping backpacks in March of 2016. Can't wait to see someone with one of those go through security at the airport. Oh wait. We're talking TSA. Never mind. This also doubles as a heater. This is the kind of thing that will get you extra screening by the TSA. Or I can put a power-strip in a bag I already own. This is simultaneously striking me as a ridiculous product and a really good idea. Brain asplode.